Walsine Pierce: THE TRUTH SHALL SET YOU FREE: What is the Truth? THE TRUTH SHALL SET YOU FREE! Will we always know the truth? In this case, it appears, I did not. It was the playing of the National Anthem and not the saying of allegiance to the flag. It was pointed out to me that not everyone at ball games, and such, always honors our National Anthem. THAT IS TRUE. But, this is not "everyone". This is the President of the United States, the Commander-in-Chief, our leader. If Gov. Bill Richardson, then Senator Hillary Clinton and Ruth Harkin understood that the honor was due, what excuse could there be that the President, standing alongside, did not? (c) All other persons present, uh, that is ALL OTHER PERSONS PRESENT, should face the flag and stand at attention with their right hand over their heart, and men, not in uniform, if applicable, should remove their headdress with their right hand and hold it at their left shoulder, the hand over the heart. While others present on the platform stood at attention, Obama did not. The other three on the platform placed their hands over their heart, Obama did not. NOW THIS IS THE TRUTH! A special thanks to those who pointed it out to me. Will it set us free? I pray it will! Although obvious disrespect to our country by our national leader may be overlooked by many, I will not be among that number. REMEMBER THIS PICTURE, FORM YOUR OWN OPINION, AND VOTE. Agreed! When we were brought up, we were taught respect. Respect for God, respect for country, and each other. Apparently, respect has gone down the drain in some circles. 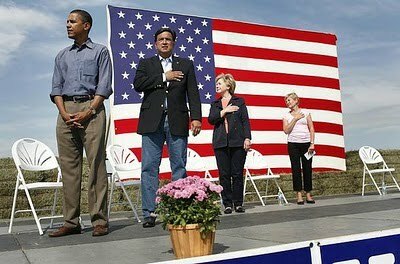 For me there is not much difference in showing disrespect for our flag and showing disrespect for our National Anthem. Another thing we were taught was etiquette in certain social situations. However, this goes far beyond etiquette. I think some individuals are lacking in both. Heck, I still feel guilty when I leave my flag out in the rain! And God forbid it ever touch the ground.